You might be able to explore Nirn with your PC friends without leaving the couch. The MMO is an almost exclusively PC-centric genre. While consoles have flirted with the idea, only a few such experiments gain much traction. The common assumption seems to be that MMOs belong on computers. Matt Firor, head of ZeniMax Online, disagrees. As next-gen consoles grow more advanced, he thinks it's possible to bring modern MMOs like The Elder Scrolls Online to the console crowd - potentially as soon as the PS4 and Xbox 720. "It's the classic desk vs. couch argument," Firor said, "but it is blurring over time. The current-gen and previous-gen MMOs were all about using the keyboard and mouse, and sure, everyone used things like Ventrilo and other voice chat services, but that only works in a small group. A lot of that has been thanks to design problems that people haven't focused on a lot, such as typing and controlling at the same time." Firor claims that the main reason we haven't seen much progress in console MMOs is simply that the technology isn't ready yet. "The 360, when announced was a pretty ridiculously cool device, but it is not so good anymore compared to PCs and even when it was announced PCs were still better than it. The technology was a little limiting for the size and scope of the world you could have. It mostly comes down to PCs being wide open. Online game development is all about doing whatever you want, pushing limitations, and it's just easier to do on an open platform. Someday, it may all change." Despite these theories, ZeniMax Online has no official plans for bringing The Elder Scrolls Online to consoles. According to Firor, the developers are working on making a quality game first and foremost. "There are a lot of rumors swirling around the next-gen coming back together with PCs," he said. "It seems like things are going back to a more standard platform. That being said, we haven't thought about it heavily right now. The worst thing you can do is worry about new platforms while in development." One aspect of the current MMO market that doesn't concern Firor is the competition. 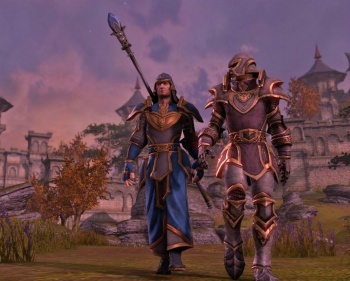 Skyrim's success seems to have proven the popularity of the Elder Scrolls series, and Firor believes that the IP can compete with other fantasy MMOs like World of Warcraft and Guild Wars 2. ZeniMax Online is not yet ready to reveal business models for The Elder Scrolls Online, but that information will be coming sometime before the game's 2013 release.